Hello crafters! 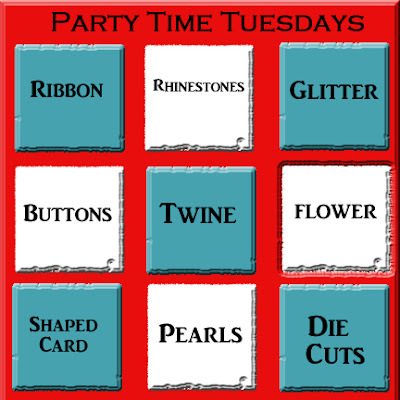 I have joined in on the Party Time Tuesday Challenge this week and it is Tic Tac Toe! This one presented a challenge for me. It was my own fault. 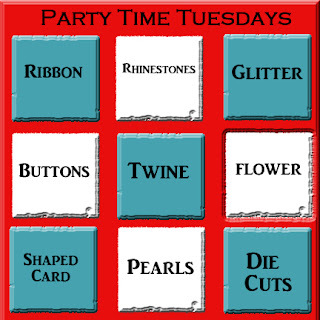 I made my card without even thinking about the tic tac toe challenge part of it! I had a CAS idea for this Bugaboo image and got my card all finished and then remembered, "Hey! You have to follow the challenge!" So I tweaked it to add glitter to his party hat, rhinestones on either side of the sentiment and ribbon to the inside. Phew! Dodged that one! I also added glossy accents to the glasses and the clock face. Join in the challenge this week for your chance at several awesome prizes: Bugaboo Stamps, SRM Stickers and Paper Pretties! Funny card Perfect for a guy. Love the CAS look & your amazing coloring. This is really funny. A great guy card for sure. Love this image Perfect for any male,Your colouring is fabulous.Thank you for joining us at Cutie Pies.